Below you will find the application for a CAUSE Foundation grant. These funds are intended to be a short-term bridge to help United Airlines Flight Attendants and their dependents in times of illness, injury, or disability. Our objective is to help with the basic necessities through an unexpected difficulty, or to provide breathing room while more permanent arrangements are made in a long-term situation. We can assist with excess medical bills, but cannot pay credit card debt or other personal financial obligations. We realize this may be a difficult process for you and want to make it as easy as possible. Before you begin this application, it is important that you call your CAUSE domicile representative. It is preferable that you fill out your application with your CAUSE representative, but if you are unable to do so, please help us help you by doing the following: Read the entire packet before filling out the application. Print clearly, as these pages may be faxed and/or copied several times. 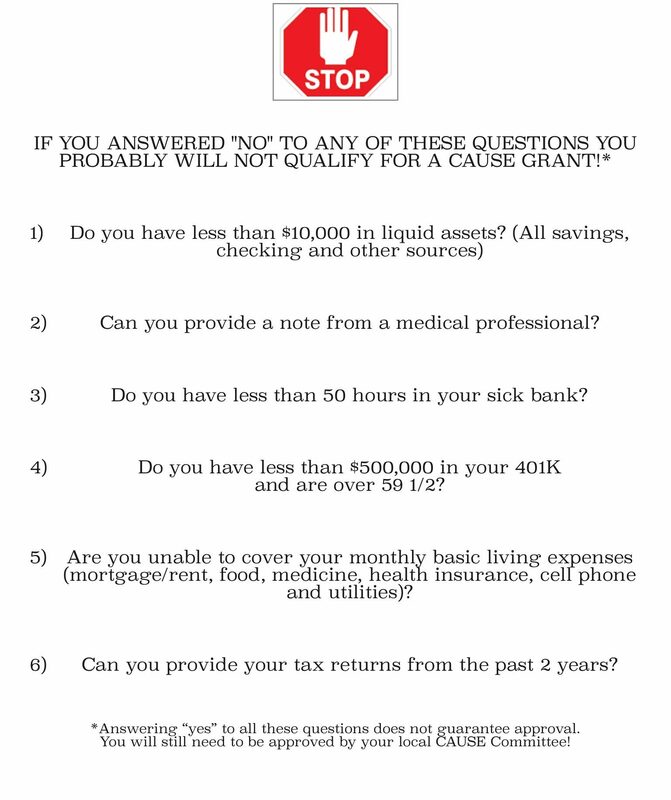 A complete application is required before any grant can be considered. We have enclosed a checklist to help you, and we ask that you initial each item as you complete it, and return a copy of it with your completed application. If your medical documentation cannot be enclosed with the application, please fax or mail it to your representative. Once all the information has been received, our policy requires that two CAUSE committee members review your application to determine the amount granted. The amounts are decided on a case-by-case basis according to need and the availability of funds. The number of applicants requesting assistance can impact that amount and ongoing assistance may vary monthly due to the volume of requests. The funds received from the CAUSE Foundation are grants. They are not taxable, nor do we ask that they be paid back. This is money our flying partners have donated to help us help each other. We have an obligation to spend it as wisely and carefully as possible. We want to assure you that this process is confidential. The Health Insurance Portability and Privacy Act requires your written permission for any information about your situation to be discussed outside the Foundation. We are here to help, and we promise to assist you as quickly as possible. Please understand, though, that this process can take several weeks to complete. Every CAUSE volunteer representative is a full time Flight Attendant, and our schedules may prohibit us from getting back to you as quickly as we would like. Feel free to contact us at any time, and we will return your call as soon as we can. Please read the “stop sign” page below carefully, before downloading the application. *This application is a total of 6 pages long. It must be filled out completely. Please don’t be discouraged by the amount of pages. Most of them only require signatures. To avoid delays in your application please contact your local CAUSE Rep for assistance with this process.